I need to remap "Select the previous input source" shortcut in macOS High Sierra 10.13. I recently installed fresh macOS High Sierra removing my previous OS and I found that there is no option to change default shortcut from Ctrl+Space to something else. I used to use macOS Sierra and I managed to set this shortcut to Cmd ⌘+Space. I didn't use any third party software for changing it, however I don't remember how exactly I changed it. Is there any way to reset it to some custom shortcut? Ideally I'd remap it to Caps Lock which is never used in practice, but Cmd ⌘+Space would also be fine. But the question is still open since this allows only to switch to and from ABC, but having three input sources you are not able to switch to the third one. Then double-click the shortcut listed to the right and enter your preference. Not the answer you're looking for? 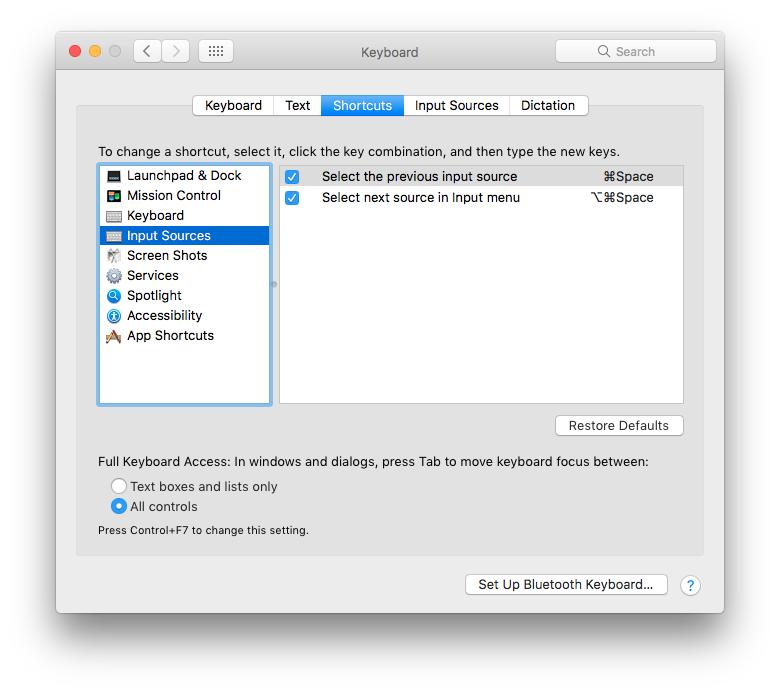 Browse other questions tagged macos keyboard shortcut high-sierra input-source . How to set “Next Input Source” shortcut in macOS Sierra to Shift + Cmd?